The grand English Tudor-style house, a jewel in Atlanta’s architecturally eclectic Buckhead neighborhood, possesses a commanding presence. From its clay chimney pots and limestone columns to its mullioned windows and porte-cochère, the three-level red-brick and limestone residence with the slate roof and half-round glittering copper gutters is a real old-world charmer. Storied houses that look like this come wrapped in history that can be peeled away layer by layer like the skin of an onion. This one, too, has a fascinating tale to tell, but it begins only a decade ago. Period-style details, including an iron band that links the two clay-pot chimneys in the front, are the Tudor’s defining features. That’s when Atlanta-based architectural designer Frank Neely was commissioned to create it. His clients, a couple with three growing children, originally asked him to expand their small, single-story 1940s wooden Colonial. 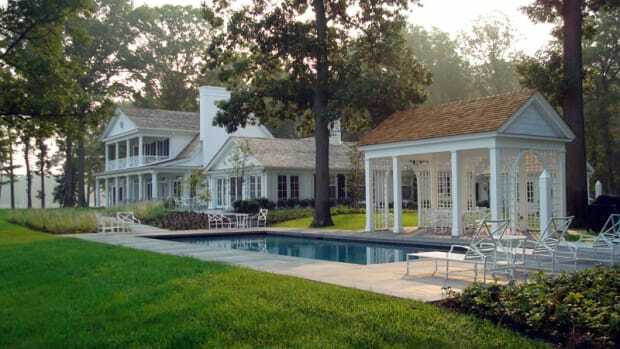 But they changed course and decided to build a new, larger house in a timeless traditional style. 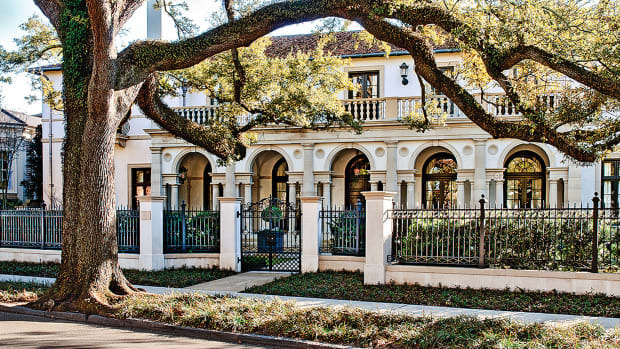 “We decided on English Tudor style, which is one of my favorites, because there were some 1920s examples in the neighborhood, which is a mix of historic styles that start in the 1900s,” Neely says. From the outset, designer and client agreed that every detail of the new house should look as though it had aged gracefully through a century of use. The 6,265-sqaure-foot house, which also has a 3,400-square-foot partially above-ground basement, was carefully sited on its long, ¾-acre plot to blend in with the houses on the block without calling attention to its imposing facade. To make impeccable age-old statements, Neely relied not only upon design but also upon materials. The red brick for the façade, for instance, was handmade. “We spent six months looking at samples and playing with color before we got it right,” he says. 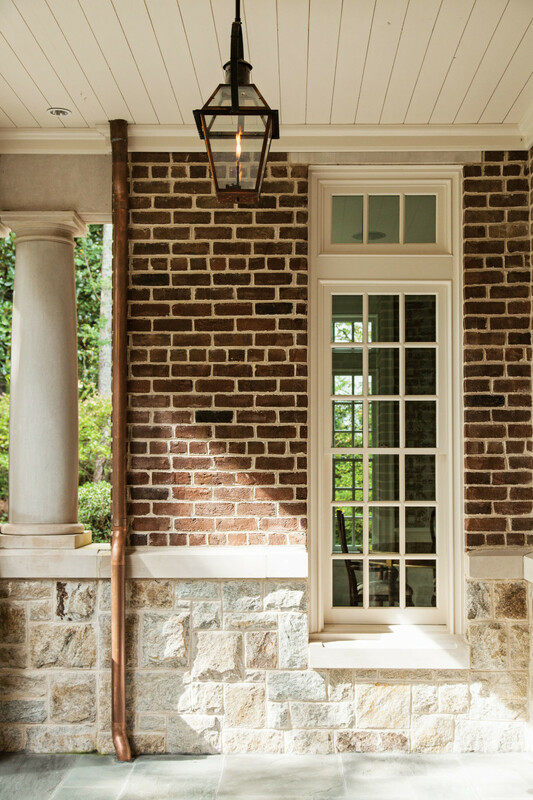 Copper gutters, handmade bricks and hand-carved limestone take the Tudor back in time. Neely revels in the “quirky details” of the house, pointing to the iron band that binds the two front chimney stacks and the pebbledash treatment of the porte-cochère’s timbered frame. Because Neely and his team designed all the elements, they were able to create a seamless, historically accurate flow between interior and exterior spaces. “The beauty of drawing windows and doors is that there’s no limit to shapes,” he says. 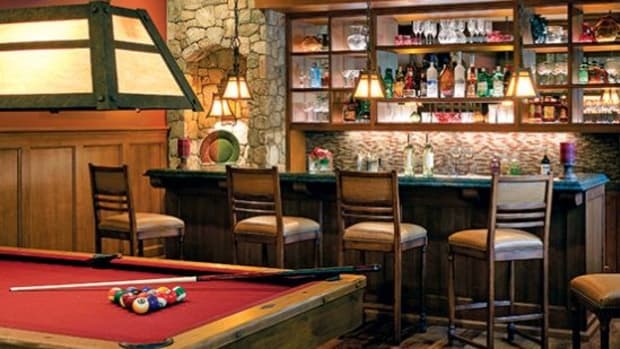 The placement of the back porch, which is centered on the backyard swimming pool and opens to the kitchen, master bedroom suite, family room and breakfast room, allowed Neely’s team to repeat its oak-beamed ceiling in the family room for continuity. The kitchen’s central island, which is made of oak, features Gothic Revival motifs. 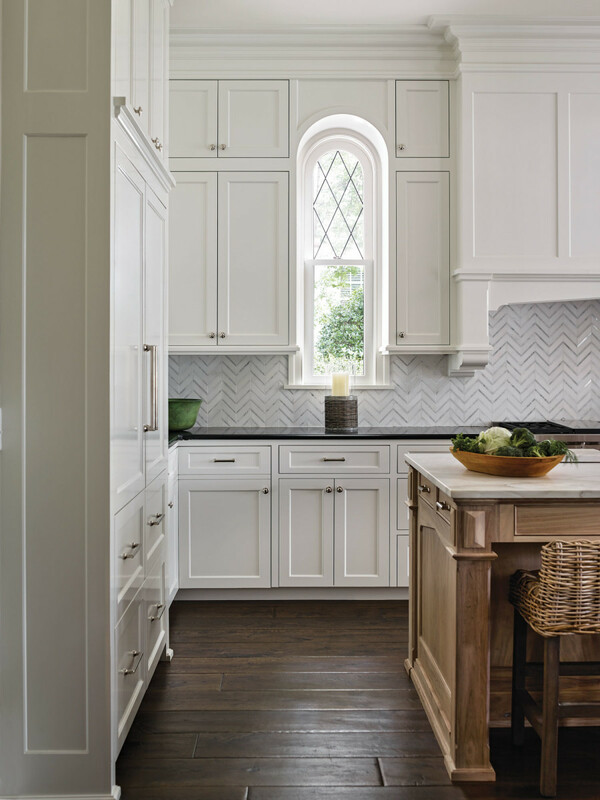 And in the kitchen, they wrapped the custom cabinetry around a small arch-shaped window like a blanket and created a central island in oak that features Gothic Revival motifs. It is the details of the house that turn back time. The walls of the master bathroom, for example, are paneled in solid sheets of ¾-inch white marble punctuated by oak timbers to emulate early 20th-century wainscoting. Custom cabinets in the kitchen were designed to wrap around the dainty arched window, another custom feature. Traditional finishes, including ebonizing and fuming on the oak woodwork and wide-plank oak floors, also helped take the house back to its Roaring Twenties roots gracefully. 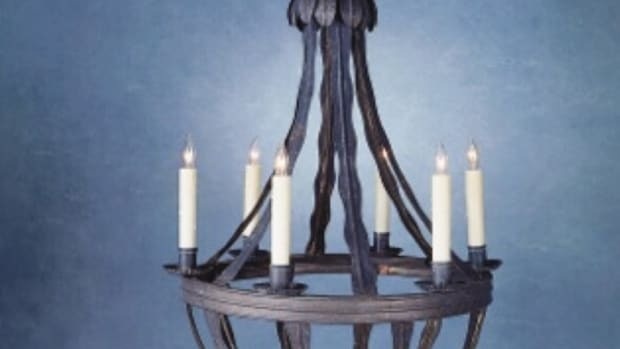 To give the central stairway’s newel post and pickets a darker fuming color quickly, the team applied diluted ammonia to the wood instead of merely exposing it to the chemical’s fumes as they did for the rest of the woodwork. Landscaping, too, was used to create the illusion of an age-old estate. The house was planned around the large, old hardwood trees that were on the property, and the sculpted plantings in the front create a formal English-style evergreen garden suitable for English Tudor-style architecture. The swimming pool takes up most of the backyard space, which also includes a pool house/garage that has an upstairs study. The rambling five-bedroom house, which includes a living room, dining room, family room, kitchen, breakfast room, butler’s pantry and library, also has some more fanciful spaces. 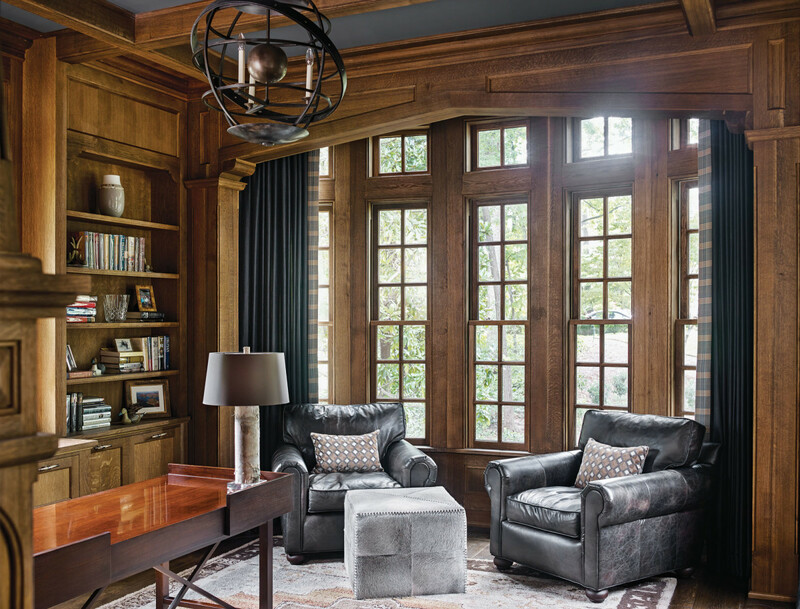 In the library, leather chairs, built-in bookshelves and expansive windows create a clubby, old-world atmosphere. There’s a spectacular round-cornered stair hall upstairs as well as a playroom whose sky-high vaulted ceiling is accented with wooden trusses. He isn’t the only one who continues to be enchanted. “The clients still call and say they just noticed something new,” he says. See more details of this home in this close-up. 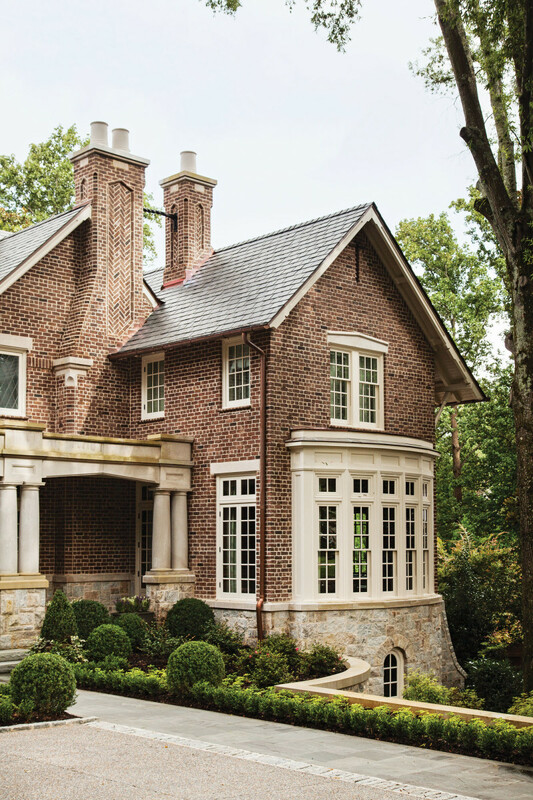 Architect David Jones creates an elegant Southern Colonial Revival getaway house in Maryland.